Crossing tides eh? Well that usually means the Bristol channel, my local playground. I'd suggested a nice, shortish paddle out to the Holm islands & Jules was up for that, then James joined the team & he suggested doing Brean Down on the English side of the channel as well. I tried to make excuses to be honest as I've done it twice before & its a long way to paddle sideways through the second highest tidal range in the World! I met the boys at Penarth at 09:15. I'm on the left, then Jules & James. The conditions were pretty much perfect with just a hint of a chill in the air. We hit the water about 0930 & paddled straight out to Brean on Jules vector diagram though we did alter course towards the end, more on that later. Jules was in my Etain as his Delphin would be hard work on this trip! Our bearing is pretty much spot on to a lateral buoy 3 miles out so we aim for that to start with. Whilst trying to avoid the wealthy boy racers. 10 Miles & two hours twenty later we reach Brean Down. The last leg we came off bearing & followed a transit line in. I like transit lines as their dynamic & change with the tide. 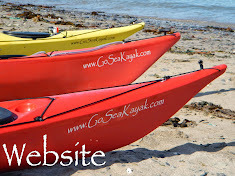 They maximise your tidal assistance & minimise tour tidal resistance as well as minimise your distance travelled. To explain this imagine your following a generous tidal vector diagram. You'd be angled more steeply than necessary into the tide, therefore working harder & paddling further, following a transit line can avoid this! I'll explain transits later in the trip. I do love this place! I should be stuffing food & water in my mouth but instead I'm running around like a child relishing the compositions on offer! In paticular the juxtapositions that low water offer. I dont overlook the small things either! These are Dog Whelk eggs. But the only Dog Whelk shells I found were home to Hermit crabs. Then back on the water. 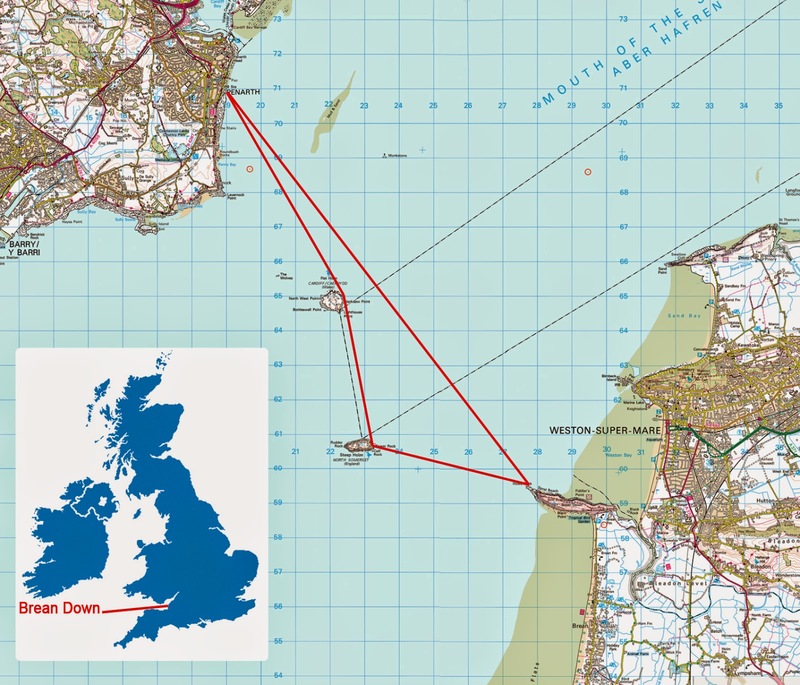 We use James GPS to reach Steep Holm as Jules vector was mysteriously out by 180°? Could it be that Indy plotted an ebb tide instead of flood??? We reached Steep Holm surprisingly quickly! The tide was ripping quite a bit when we left the Brean Down, so much as even reaching Steep Holm seemed uncertain but here we are! Might have to take my word on this but that dark blob in the water is a Grey Seal. I still love the Seagulls too though. All to soon & we're back underway with 7 miles still remaining. At least we can Island hop this section & take rest stops. Leaving the Island the tide is running so we use transit lines to reach our target. Basically I kept the green lateral mark in line with the edge of the island. 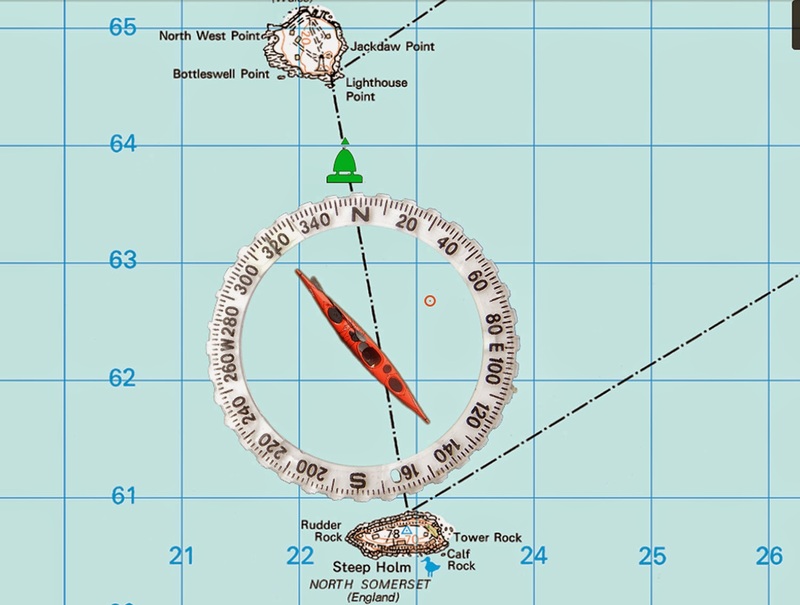 The buoy is called Middle Holm, theres a clue in the name there as it marks the half way point between the Islands which means we'll pass it & loose our transit line. Its for that reason that whilst following the transit line I also set the bearing it gave me on my compass, 320°. As I pass the buoy that bearing that I set on the compass will come in handy! I could also look for another transit line on the mainland. In reality I did both. Just 4½ left to go so we push on through Castle Rock, (literally). Then head for the mast on the mainland as a guestimate bearing whilst checking James GPS for confirmation. More traffic to avoid! We had to stop for this boat as it really was on a collision course. Looking back at where we've been.